J.D. Schraffenberger is editor of the North American Review and an associate professor of English at the University of Northern Iowa. 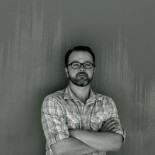 He’s the author of two books of poems, Saint Joe’s Passion (Etruscan Press) and The Waxen Poor (Twelve Winters Press), and his other work has appeared in Best Creative Nonfiction, Brevity, Hayden’s Ferry Review, Mid-American Review, Notre Dame Review, Poetry East, Prairie Schooner, and elsewhere. He lives in Cedar Falls, Iowa, with his wife, the novelist Adrianne Finlay, and two young daughters.